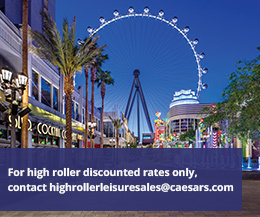 For a true high-roller experience, guests can pair their stay with a bevy of perks ranging from limo transportation to-and-from McCarran International Airport to access to a personal concierge in select suites and around-the-clock butler service in villas. At Nobu Hotel at Caesars Palace, where sophisticated Japanese cuisine takes center stage, guests can take in-suite dining to new heights with spectacular creations prepared live by one of the hotel’s master sushi chefs in the striking Nobu Villa and Nobu Penthouses. Known as the place to play for its roster of A-list celebrity guests, Planet Hollywood Resort & Casino’s 231 newly restyled suites feature bold designs and stunning views of the glittering skyline. Design details in the Ultra Apex and Ultra Boulevard suites feature daring décor elements such as suspended sofas, lounge-style living spaces and oversized modern artwork. 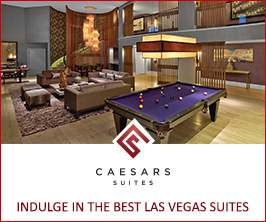 Caesars Palace’s sprawling villas, rarely seen by the public, remain the crown jewel of the suite collection. With spacious floor plans spanning an average of 8,800 square feet and pricing starting at $15,000 per night, these opulent villas feature imported marble floors, private elevators, hand-painted wall murals and more and are paired with amenities such as private butler and concierge services. Similarly, the boutique Nobu Hotel is home to the exquisite three-bedroom, 10,300-square-foot Nobu Villa. Designed by David Rockwell and Rockwell Group, the $35,000 per night Nobu Villa is the hotel’s only rooftop villa, offering unsurpassed views of the world-famous Las Vegas Boulevard.